Even though rebates paid by biopharmaceutical companies can substantially reduce the prices insurers and pharmacy benefit managers (PBMs) pay for brand medicines, insurers use list prices—rather than discounted prices—to determine how much to charge patients for their coinsurance and copayments, further increasing what consumers pay. In many cases, a consumer pays more to fill a prescription than the PBM paid to purchase the drug, even though consumers “assume what they are paying is the cost of the drug,” said Susan Pilch, vice president for policy and regulatory affairs with the pharmacists’ group. The percentage of people paying more than $1,000 out-of-pocket a year for medicines also is on the rise: From 2004 to 2014, the portion of people spending more than $1,000 outside of their insurance coverage nearly tripled, from 1% to 2.8%, according to the Kaiser Family Foundation. Kaiser also reported that 8% of adults report foregoing prescriptions because they can’t afford them. 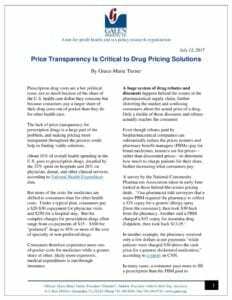 “While biopharmaceutical companies set the list prices for their medicines, it is the health plan that ultimately determines how much a patient pays out-of-pocket,” said Stephen J. Ubl, president and chief executive officer of the Pharmaceutical Research and Manufacturers of America, or PhRMA, which commissioned the analysis. While originally designed to help entities that serve the nation’s most vulnerable patient populations to stretch dollars further, the number of 340B entities has soared and now includes most major hospitals and many specialty medical practices, such as oncology clinics. 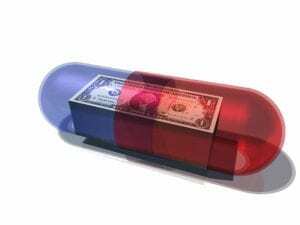 While 340B discounts affected 3% of hospital drugs purchased in 2004, hospitals in 2013 received 340B discounts on more than a quarter of their drug purchases.